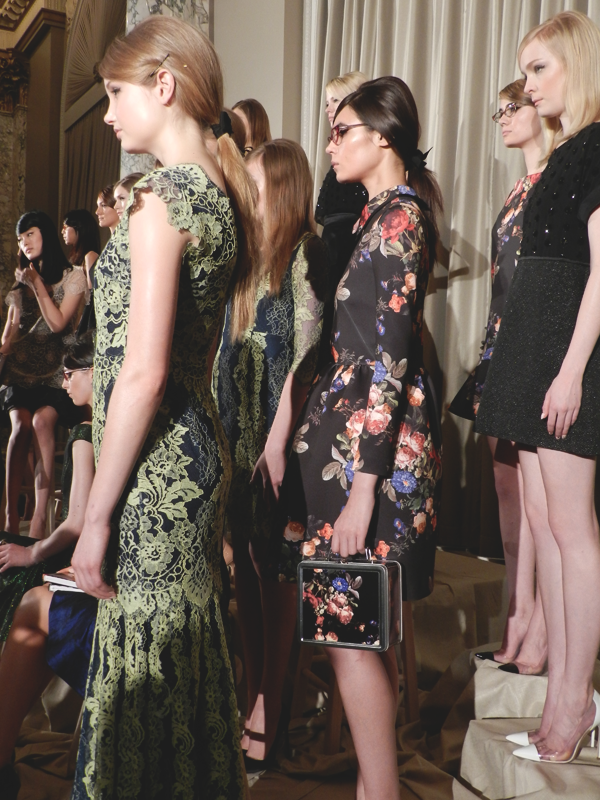 Erin Fetherston debuted her Fall 2014 collection at the W Hotel in Union Square on Thursday night. Fetherston found inspiration in the legendary Barbizon Hotel, which was part residence, part charm school, and the destination for young women in the pursuit of living the New York City dream. Fetherston's beautiful dresses emulated the stylish ladies that made the Barbizon Hotel their home, including beauties like Grace Kelly, Cybill Shepard, and Edith Bouvier Beale. Sticking to her strong aesthetic, Fertherston created bold and flirty cocktail dresses, skirts, and gowns. These woman not only were sophisticated, but know how to have a good time. all photos taken by me. view more pictures here. I loved the mod feel of this whole collection. One of my favorite pieces is the Charmed, I'm Sure sweater. It's so quirky, and something maybe a little unexpected from Fetherston. Her tailoring and use of fabrics are undeniable. I just wished that the presentation itself was spread out more so that I could have gotten a better look at some of the dresses that were hiding in the back. I especially adored the pink flower tulle dress that was sitting pretty on a model high up on a ladder. I just could in-vision myself frolicking and twirling around in it. Then there were some dresses that were just made for the holidays like the shimmery emerald off the shoulder dress. Also I will like to point out, I'm already in trend for Fall 2014 make-up. CAT EYES! 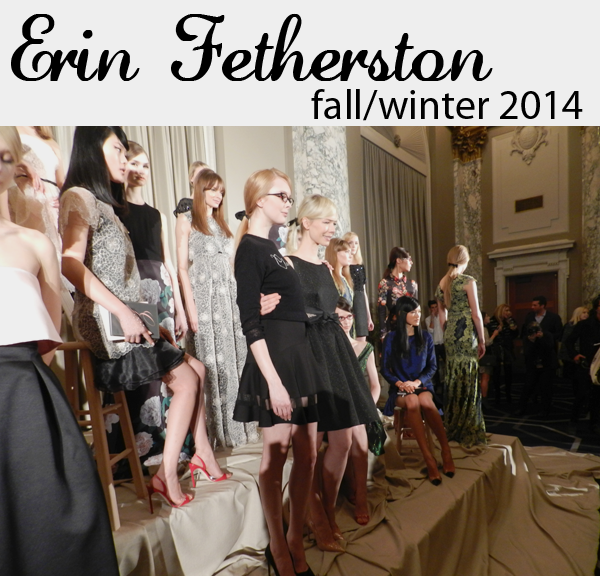 What do you think of Erin Fetherston's Fall 2014 Collection? I'm so excited for this collection. The Charmed sweater is definitely making its way home with me and I'm quite smitten with that black dress with the lilac and pink floral print. You have a lovely blog <3 love the collection!! such a stunning collection; she never fails!